The single-serve coffee maker market offers a lot of options, many that are well-established and have been around for years. Although there have been Starbucks coffee pods for some of these brewers, this is the first time Starbucks has actually marketed its own brewer, the Verismo, with its own pods. Was it worth the wait? The Starbucks Verismo 580 brewer has a small profile so you’ll easily find a spot for it on your counter, and it comes in silver, black or champagne so you can pick the one that blends best with your decor. The water tank sits on the back of the machine out of sight so it’s an attractive, yet unobtrusive brewer. Once you turn it on, there are just three buttons to deal with to make your coffee. There’s a button for espresso drinks, one for standard coffees and one for milk. Yes, there is a powdered milk pod that you use for lattes and it really does give you a nice frothy milk. Other single-serve pod brewers either don’t handle frothing milk or require you to use a separate machine. Not so with the Verismo. 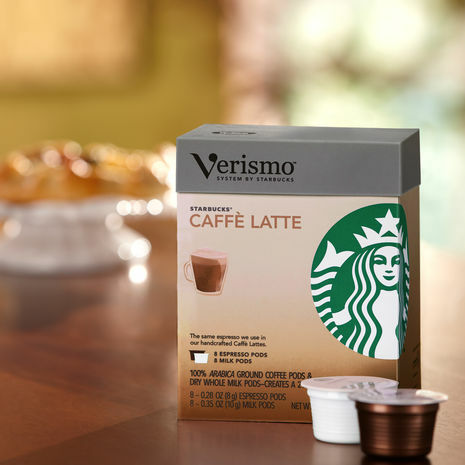 The Verismo is also different in the selection of available coffees. There are not countless flavors as there are with other brewers. You can pick from three brewed coffee selections that are mild, medium or dark roasts or choose regular or decaf for the latte/espresso pods. There are also syrups available to customize your drinks, but the coffee selection is limited. I spoke with the folks at Starbucks and asked them about the limited selection. They explained that they are focused on delivery a consistent, quality cup of coffee in line with what they serve at their shops. They aren’t aiming to be the brewer with a thousand different pods. They’re aiming to be the brewer with the best cup of coffee, although they will be introducing a few new varieties like the seasonal Christmas blend which is out right now. I received a Verismo brewer for this review, and it did deliver a delicious beverage. It was also amazingly consistent. The temperature was always the same and the amount of coffee and milk in my mug was precise with every cup. I’ve had a lot of single-serve brewers and none of them have been this consistent. Is it just like getting a cup of Starbucks coffee at one of their locations? It’s not exactly the same, but it’s darn close. The flavor, strength and temperature matched up and it was great to have my Starbucks before I left the house. It’s worth nothing, however, that you’re not going to be able to fill up your travel mug without a little work because there’s not enough clearance beneath the spout. If you’re someone who likes coffee but doesn’t much care if it came from Starbucks or is a watered-down generic from any old place, then this is not your brewer. If, on the other hand, you are looking for the rich flavor and consistent coffee you get at Starbucks, then you need one of these in your kitchen. The Verismo 580 retails for $199 and is now available. Starbucks is also running a Black Friday promotion from November 23rd thru November 26th where purchasers will automatically get instant Starbucks Gold Card status. This will earn you extra rewards and discounts at Starbucks locations. It’s been a long wait, but for Starbucks coffee fans, it was well worth it as the Verismo finally gives you the chance to have the coffee you love brewed right in your own kitchen.